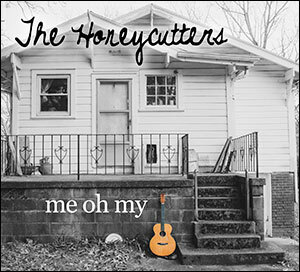 This is the Honeycutters third album but until receiving a review copy of this recording I had been virtually unaware of them. I must admit that when I saw the name it conjured up for me a picture of what could possibly be sweet sugary country music. That statement couldn't possibly be much further from the real picture! Certainly this is country music and there is great beauty within these songs on this tremendous album of contemporary country music, but what raises it way above the pack is a distinct edginess that whilst difficult to define, none the less does exist. From Asheville, NC, this talented five piece band has described their music as 'Appalachian honky tonk,' an appropriate description of a style that has even more to it than their description suggests. In fact, on a few rare occasions you pick up an album that is so good, descriptions are really superfluous, other than the fact that the album 'just has IT!' That is the case with this stunning recording that to my ears is the perfect listening experience and if you are considering it purely on it's country music merits, it is certainly one of the best of 2015 and possibly of this decade. It really is that good! The band is made up of Amanda Anne Platt, lead vocals, acoustic guitar, songwriter and producer, Tal Taylor plays mandolin, Matt Smith, pedal steel and resonator guitars, Rick Cooper, acoustic and electric bass and harmony vocals and Josh Milligan, drums, percussion and harmony vocals. Amanda's gorgeous expressive vocals are at times reminiscent of Natalie Merchant at others they have the 'sassiness' of an artist such as Eilen Jewell or even the edgy drawl of Lucinda. She is the focal point of the band as you would expect from someone who wrote, produced and sang all of the songs but the Honeycutters are very much a tightly knit band with the four men's musical skills bringing out the very best in Amanda. The album has a lovely casual feel to it, as if they are all so comfortable working together adding a full pallet of colour to Amanda's excellent songs. The songs cover a whole range of tempo's and styles within country music, from heartrending ballads to upbeat virtual country rockers with Amanda's lovely vocal style comfortable with whatever she chooses to sing. Whilst I always look for the positive in music, it is impossible to find anything negative about this recording, but I would have to say that at this moment Amanda is my favourite singer, with a light laconic touch, a powerful femininity and her deeply evocative style carrying everything else along despite the quality of her band. Album opener, Jukebox sets the scene beautifully. It is a lovely mid tempo country ballad with gorgeous steel guitar and an appealing 'drawled' vocal with echoes of a young Lucinda Williams, joined by brass and with rock solid bass and percussion. It is followed by All You Ever with its shuffling percussion, bass and steel guitar starting things off before Amanda's gorgeous vocal comes in with keyboard and mandolin before the song builds, with the harmonies lifting the song to a mid tempo beauty with its stunning melody and the appealing femininity of Amanda's vocal. There is a slow moody steel and twangy guitar on the title track Me Oh My, a sad tale that kicks against family expectations, in some ways made more so by the beauty of the melody. The percussion and bass are as usual perfect and the tuneful lead guitar and mandolin just add to the beauty and give a tremendous song a further lift. Not That Simple is a song that as with many other songs on this album is lifted by minor changes in tempo. There is a dobro, percussion, thumping bass, steel guitar and excellent harmonies supporting Amanda's stunning vocals. There is a lovely dobro and mandolin intro joined by a light percussion and Amanda's gorgeous vocal on Wedding Song a beautiful ballad that has a metronomic foundation courtesy of bass and percussion allowing everyone else free rein! Finally, Hearts Of Men has a lovely steel guitar on a wistful reflective ballad, with the usual bass and percussion and excellent harmonies, the tinkling mandolin, occasional dobro and twangy guitar all topped off by a gorgeous melody and, of course, Amanda's beautiful and evocative vocal. I will in all probability return to this tremendous album time and time again, such is its peerless quality. There are so many albums of 'country music' that i've heard that whilst otherwise excellent just don't have that extra edge, in fact sometimes after a few plays I start to feel they sound a little twee and lacking in anything that can sustain the listeners attention. This is most definitely not one of those recordings. Everything about this screams quality but added to that is that indefinable edge that raises it to giddy heights that have been explored by very few others! The album clocks in at fourteen beautifully conceived songs and at nearly an hour in length. That is probably the only criticism I can come up with. It should be two hours and twenty eight songs or three ...........!